This 8th annual dealer conference event will provide Installers across the country the ability to see new products, receive hands-on training and meet the solar and renewable energy industry’s leading vendors and manufacturers. Morningstar will conduct a training session concerning the MultiWave Inverter/Charger and energy storage. Attendees will receive one NABCEP CE credit. On February 21st & 22nd, 2019, HES PV will welcome solar business owners and installers to the Delta Hotel, Victoria BC for two action packed days of information, training and networking. See the latest solar electric products including Morningstar’s MultiWave inverter/charger, and get new tools to help your business grow in today’s dynamic and prosperous solar industry. This event offers dealer training and a chance to talk with a variety of solar manufacturers and their products. Morningstar will be showcasing its Multiwave Inverter/Charger as well as its complete portfolio of charge controllers, inverters and accessories. Morningstar will present off-grid charging and inverter solutions with a focus on the MultiWave Inverter/Charger. The content presented in this conference is geared toward seasoned PV industry professionals who have several years of installation, solar + storage, technical sales, design, O&M, or system inspection experience. This is the only industry event that allows NABCEP Board Certified Professionals to obtain as many as 21 hours of continuing education credits needed toward their recertification. ISC West is THE largest converged security industry trade show in the U.S. Many of Morningstar’s products are used to regulate power in off-grid solar security and monitoring applications and we will be exhibiting and answering questions at the show. Intersolar Europe is the world’s leading exhibition for the solar industry and its partners and takes place annually at the Messe München exhibition center in Munich, Germany. Morningstar will display the latest Lithium Iron Phosphate battery brands in its new Energy Storage Partner (ESP) program as well as the MultiWave Inverter/Charger. The complete portfolio of legacy Morningstar charge controllers, inverters, and accessories will also be on exhibit at Booth B3.160. A three-day program around self-sufficient solar, wind and hydro power systems and the off-grid power supply. 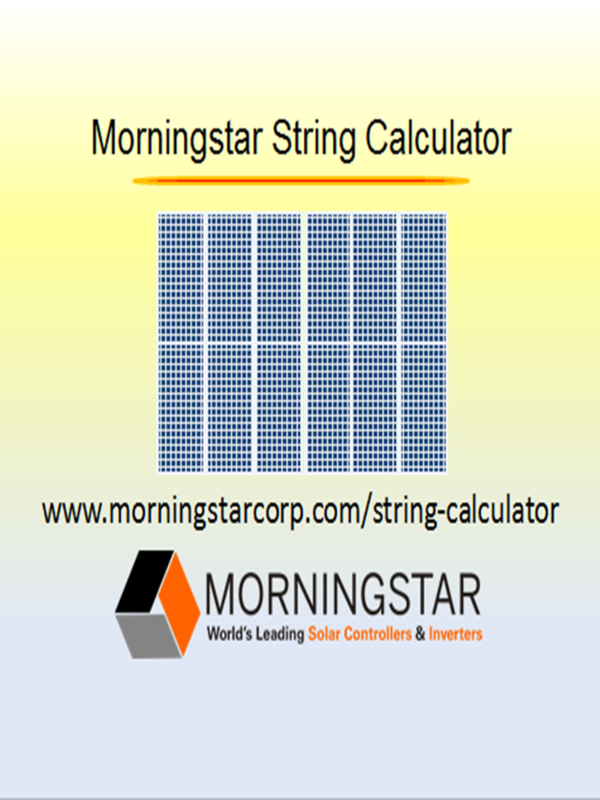 morningstar will exhibit and provide training on the 230V version of its MultiWave inverter/Charger. Railway Systems Suppliers, Inc. is a trade association serving the communication and signal segment of the rail transportation industry. Morningstar products that regulate off-grid solar power in railroad applications will be on display and our representatives will be there to answer questions. SPI sets the standard for solar events as the fastest growing and largest solar show in North America. Morningstar will exhibit its complete line of controllers, inverters, and accessories, and conduct a training session on the split phase version of its MultiWave Inverter/Charger.